This is very common question, as it should be. Once someone invests in eyelash extensions they will want to know how long they will last for. Last month we learned more about how the eyelash extensions are applied; one eyelash extension goes on one natural eyelash. One eyelash extension is applied to one natural eyelash. With Flawless Lashes your eyelashes are able to grow, move, and shed just as they would without extensions. When the natural eyelash sheds, the extension falls out with it. If you have extensions you will notice if you pick up a fallen eyelash extension, there will likely be a natural lash attached to it. This is a good thing! It means your eyelash extensions are holding on until your natural eyelash sheds on it’s own. We can shed anywhere from 1 up to 5 natural eyelashes per day! When you don’t have eyelash extensions, it is not obvious this is happening. But once you have extensions, you will be able to tell after 2-3 weeks that you have shed many eyelashes. Here is one of our clients 2 weeks after her last touch up (top photo) and after her touch up (bottom photo). The top lashes look a little messy from cleansing them, but don’t worry they don’t look messy at 2 weeks, she could comb them right into place and potentially go one more week if she wanted. 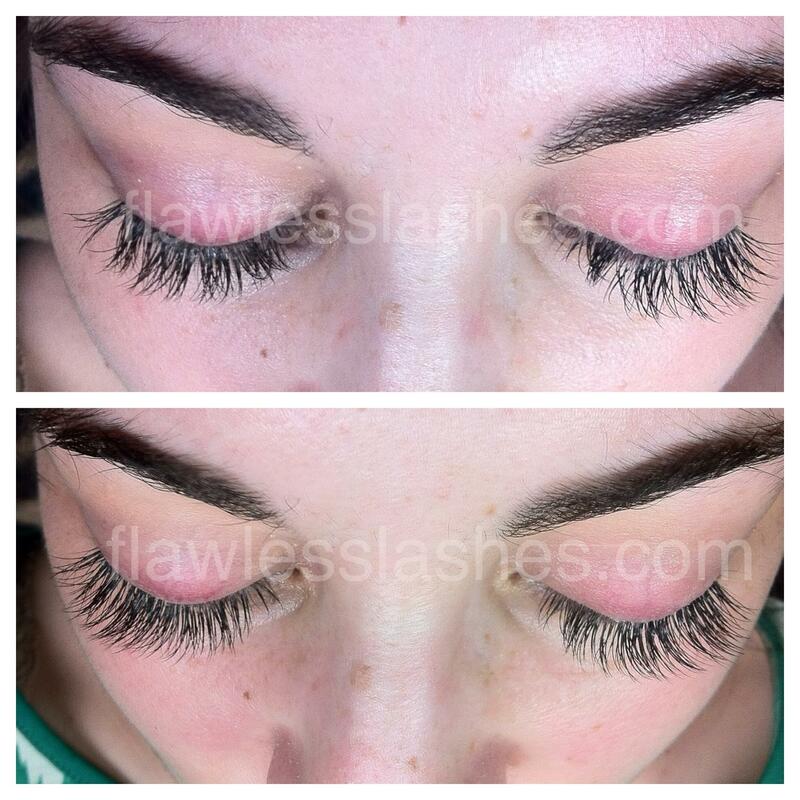 Eyelash extensions after 2 weeks (top) and after touch up (bottom). As for whether you should go 2 or 3 weeks truly depends on a few factors: how quickly your eyelashes grow and shed, how you care for your eyelashes, how full you want them to be all the time. So a client who has lashes that grow and shed quickly, wears a lot of eye makeup daily, or just wants her lashes as full as possible all the time tends to need to come every 2 weeks. Clients who have lashes that grow more average or slow or don’t wear too much eye makeup, and keep their lashes very clean can, typically go 3 weeks between appointments. 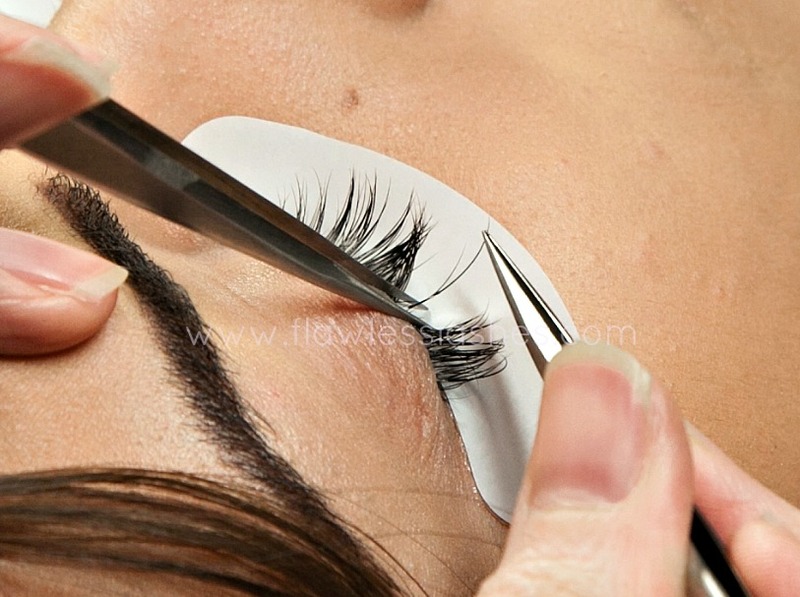 Many eyelash extension salons will advertise that lashes last up to 6 weeks. This is simply a stretch of the truth. Technically yes, you will have some eyelash extensions on after 6 weeks, but not many at all, and it will not be the beautiful look you are imagining. So due to natural shedding, a 2 or 3 week schedule is a realistic time frame of when you should get them refreshed. Since we are always adding new extensions at each touch up appointment, with regular, consistent touch ups you should never need to invest in a full set of eyelashes again.